CaribPR Wire, NEW YORK, NY, Weds. Apr. 17, 2019: The countdown is on to an exciting free benefit concert for the US Virgin Islands this May 18th in St. John. The “Music Is Life” benefit is being presented by Intellectual Global Concepts, (IGC), in collaboration with The Coral Bay Caribbean Oasis, The RTPark, The University of The Virgin Islands, (UVI) and Grammy-Award winning Jazz Drummer, Dion Parson. It is set for May 18th-19th from 5 p.m.-12:30 a.m. at The St. John Bayfront at The Coral Bay Caribbean Oasis. The event will feature world renowned South African electronic music maestro, Hyenah, who is known for his elusive identity, top charting tracks on ‘Resident Advisor,’ and his performances at top clubs across the globe. Additionally, the event will showcase USVI’s own Cool Session Brass Band and UVI’s SHUT Down Band along with DJ Mike Swells of NYC and local fire dancers and drum circle. Event attendees will also be able to experience the local food culture with several amazing food vendors placed throughout the venue and an online Silent Auction at 32auctions.com/musicislife, that will feature a fantastic selection of prizes with winners of the auction announced live at the event. Taxis will be available to bring guests to the venue and back for US $6 each way, while boat operators will offer trips from St. Thomas to St. John throughout the entirety of the event along with late night options for transportation after the event ends. Proceeds from the event, merchandise sales, food, art, merchant vendor fees and sponsor donations will be used to bolster music education via the Music Education Program at the University of The Virgin Islands lead by Mr. Parson. Both the St. Croix and St. Thomas campuses were heavily impacted by the 2017 back-to-back Hurricanes Irma and Maria that damaged the university and the RTPark’s 64 West Center Building, leaving a long-lasting impact on the local economy. This event has a limited number of attendees so music fans must register for free tickets only on Eventbrite or donate US $10-50 for a variety of donation packages, including items like T-shirts and free drinks at the venue. Sponsors interested in collaborating with IGC on this event can contact organizers at musicislifeusvi@gmail.com. CaribPR Wire, NEW YORK, NY, May 19, 2017: The University of the Virgin Islands Research & Technology Park, (UVI RTPark), will celebrate Caribbean Week in New York and Caribbean American Heritage Month in the USA with a Big Apple VIP Investment Showcase Reception this June. The event is set to introduce the opportunities of the RTPark program to business leaders and key members of the Caribbean Diaspora in New York and highlight the many advantages to doing business with the RTPark program and the US Virgin Islands. The UVI RTPark program, established in 2002, is a specialist economic development agency that aims to successfully establish the U.S. Virgin Islands as a premier business destination of choice for firms in knowledge and technology intensive sectors. It gives many qualified entrepreneurs and business owners an opportunity to #WorkFromTheBeach by benefiting from generous tax incentives while they enjoy the lifestyle of an island paradise. Investment projects that are focused on quality are screened for their likelihood of fit in the RTPark program. The priority sectors include bio-medical devices, personalized medicine applications, wellness and healthcare management, energy research and systems, including renewable and clean technology, energy efficiency, energy management and sustainability solutions, as well as firms that will draw on advances in marine science. The RTPark has also had success in attracting Internet advertising firms, technology-mediated entertainment companies and advanced logistics and supply-chain management firms and recently welcomed Intellectual Global Concepts LLC and Anvil 1 LLC as clients. The RTPark program is headquartered in a US $13 million, LEED certified green two-storey, 18,000 square foot building near the main entrance of the University of the Virgin Islands, Albert A. Sheen campus just off of the Queen Mary highway, in St. Croix. For more information about the UVI RTPark, call 340-692-4300, email info@uvirtpark.net. ENGLEWOOD CLIFFS, N.J., Feb. 23, 2015 /PRNewswire/ – Kennedy Funding Financial, LLC, one of the world’s largest private lenders, has suspended all lending in the U.S. Virgin Islands, encompassing St. Croix and St. Thomas, citing bureaucratic problems in the territory’s foreclosure process. “Due to the incredible delays in the foreclosure process, we have decided to join many other U.S.-based lenders in this action,” said Kevin Wolfer, the firm’s CEO, citing the territory’s governmental process and courts. “These delays are preventing lenders from recouping their investment dollars in the islands. Kennedy Funding Financial, LLC, one of the largest direct private lenders in the country, specializes in bridge loans for commercial property and land acquisition, development, workouts, bankruptcies, and foreclosures. The principals of the company have closed over $2.5 billion in loans to date. The firm’s creative financing expertise enables the closing of equity-based loans of up to a 70% loan-to-value ratio, from $1 million to more than $50 million, in as little as five days. Kennedy Funding Financial, LLC continues to actively seek new funding opportunities throughout the world. 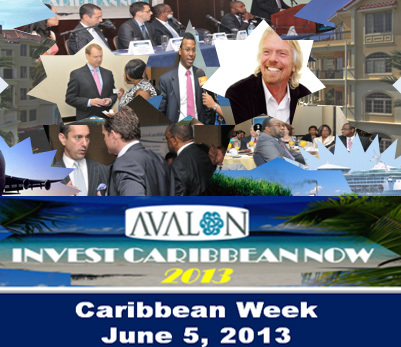 CaribPR Wire, NEW YORK, NY, Fri. May 3, 2013: The deadline for exhibitors and advertisers to sign up for the Avalon Invest Caribbean Now 2013 forum is drawing to a close and so is the opportunity to reach and do business with almost a dozen Caribbean governments, investors and high net worth delegates. Invest Caribbean Now, (ICN), which is presented annually by The Caribbean Tourism Organization, (CTO), and digital media solutions company, Hard Beat Communications during Caribbean Week in New York and Caribbean American Heritage Month in the United States, is set for June 5th from 7:30 to 11:30 a.m. at the Radisson Martinique Hotel, 49 West 32 Street in New York City. An invitation only VIP reception at The Yale Club, presented by The Government of The Turks & Caicos Islands, will precede the event on June 4th. The definitive Caribbean investment forum, will feature a United Nations-type “general assembly” of ministers from about a dozen nations from the Caribbean, including a delegation from the Turks & Caicos Islands led by Premier Dr. Rufus Ewing Finance Minister and Washington Misick; Minister of Tourism & International Transport, International Trade, Industry, Commerce & Consumer Affairs St. Kitts, Ricky Skerritt; Chief Minister of Anguilla, Hubert Hughes; Minister for Tourism, Heritage and Creative Industries, St. Lucia, Lorne Theophilus; Chairman of the CTO and Commissioner of Tourism for the USVI, Beverly Nicholson Doty and Assemblyman Tracy Davidson-Celestine, Deputy Chief Secretary and Secretary, Division of Tourism and Transportation of Tobago, among others. Speakers will include Alan Loewenstein of Wedgewood Capital; Premier Dr. Rufus Ewing and Minister Washington Misick of the Turks & Caicos Islands; Sun Guoxiang, the Consul General of the People’s Republic of China in New York City; Chair of the CTO, Beverly Nicholson-Doty, Brian Lilly, CEO of Lilly Broadcasting and One Caribbean Television, Ganesh Ramanathan of Hard Beat Communications, and Grace Lappin of Avalon Partners. Invest Caribbean Now is the most promoted event on the Caribbean Week in New York calendar, with over 200 media placements to date in the US, Caribbean and Latin American media and advertising via 30 media partners – on television, on radio and the web. ICN 2013 is made possible with sponsorship dollars from marquee sponsor Avalon Partners, gold and reception sponsor, The Government of the Turks & Caicos Islands; and bronze sponsor, One Caribbean Television. SAINT CROIX, U.S. Virgin Islands, Oct. 29, 2012 /PRNewswire/ — Seaborne Airlines, the regional carrier based in St. Croix, USVI, today announced its capacity plans to and from the US Virgin Islands (USVI) for Spring, 2013 and beyond. Starting in February 2013 Seaborne plans to introduce new equipment to the USVI on select flights – - the 34-seat Saab turboprop – - to both Cyril E. King Airport at St. Thomas and Henry Rohlsen International Airport at St. Croix from Luis Munoz Marin International Airport at San Juan, Puerto Rico. The Saab operates with two pilots, a flight attendant, in-flight service and a lavatory. Effective April 1, 2013 more flights will be added between St. Thomas’ Cyril King International Airport and St. Croix’s Henry Rohlsen International Airport with 17-seat Twin Otter aircraft. Combined with existing Twin Otter Seaplane service between the seaplane bases in Charlotte Amalie and Christiansted, Seaborne plans to operate 300 weekly flights with over 10,000 seats into and out of the USVI – becoming the Virgin Islands’ largest carrier in terms of capacity. USVI travelers will also have access to Seaborne’s premium lounge at San Juan’s Luis Munoz Marín International Airport. The lounge offers comfortable seating, work areas, charging stations, light refreshments, WIFI access, and Direct TV. Additionally, Corporate Seaborne customers have access to FasTrak SJU security access, which allows travelers to go to the head of the TSA line. This new capacity to and from San Juan International as well as continued seaplane equipment upgrades have been made possible by the expanded business partnership between Seaborne and the Government Employee Retirement System (GERS) of the US Virgin Islands, according to Gary Foss, Seaborne Airlines President. "As we move forward with this historic expansion – we want to thank GERS and the Government of the US Virgin Islands for their support and confidence in the Seaborne business model and growth plan. We also want to thank our customers who have supported us for over 17 years. As one of the largest private employers in the USVI, we understand the importance transportation plays. In concert with the GERS investment that makes possible additional capacity with larger aircraft, we will enhance tourism and commerce, while adding more jobs in the USVI as we move forward through 2013." Tourism Commissioner Beverly Nicholson-Doty concluded, "We are extremely pleased about Seaborne Airlines plans to increase service to the Territory and between our islands. She said, "The added capacity and equipment upgrades encourage more inter-island travel and ensure that travelers enjoy improved access to the Territory, better connections, and greater comfort. This news is especially welcome from a locally-based airline that is uniquely positioned to bring additional employment and revenue to the Territory." Seaborne Airlines – named Best Small Air Transport serving the U.S. Virgin Islands every year since 2007 – operates over 350 weekly departures between San Juan, St. Croix, St. Thomas, and Vieques and starting December 2012, Tortola and Virgin Gorda. Operating for 17-years in the Caribbean, Seaborne has carried more than 2 million customers since 1995. With both seaplane and Airport airshuttle operations, all aircraft operate with two pilots under US FAR Part 121 flight rules. Flights can be reserved via the Internet at www.seaborneairlines.com or calling 866-359-8784.